that's IT... i'm not gonna take it anymore! I live with three other adults, chronologically speaking. We all four have jobs. The kids also go to college locally. We're rarely home at the same time, except to sleep. If you aren't there yet, as a mom, brace yourself. If you are, remain strong. You too can survive living with adult children and a husband. Just keep repeating our Survivor mantra: Outlast, Outwit, Outplay. And since none of us is perfect, I always add, Outlove and Outpray. My issue of the moment is the kitchen... no one wants to own it, but me. 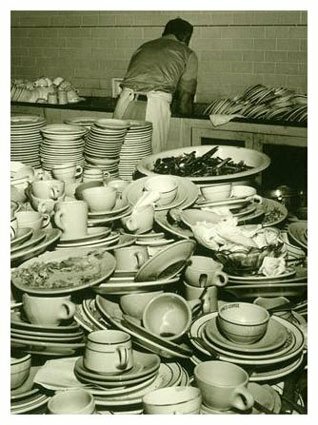 On a regular basis I find dishes in the sink encrusted with dried food, dishes on the coffee table, counters crumby and trash overflowing. As an add-on problem, our electric dishwasher works if it feels like it. You'd think it was in an Appliance Union or something. So, back to my moment of insanity... or clarity. (You can decide what it was.) For the millionth time, I cleaned the kitchen, emptied the overflowing sink and wiped down every surface. I removed the trash, decluttered the table of old newspapers and junk mail. I swept the floor and shined my sink until it gleamed. The FlyLady would be so proud. All in a day's work, right? Time to take action... I decided to do what others may not have the guts to do. Bravery in the kitchen takes on a whole new meaning! I calmly removed all but four knives, forks and spoons from the silverware drawer. 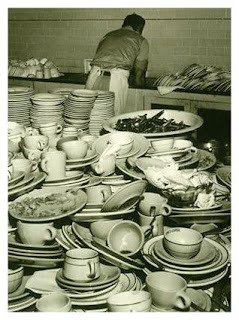 I quietly hid all but four glasses and four plates. I went to my husband's workshop and found a handful of large zip-ties. I returned to the kitchen and zip-tied all of the cabinet doors closed. That's right. You heard me... zzzzziippppppp! I'm not supporting this abuse anymore! 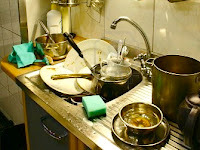 On the counter, I placed disposable plates, cups and plastic flatware. I was determined to make my point very obvious. My family was not amused by the extreme approach. They gave each other the, Uh-oh, Crazy Mom is back look. I sweetly announced my plan to cooperate and keep clean. After all, they're from the Sesame Street generation... don't they remember any of that cooperation crap? The biggest problem with my plan is that I am the one being punished. I am obsessed with beautiful dishes and own many. If there was a Dish Addict's Anonymous, I would attend regular meetings. I wish I didn't care about eating a lovely meal off pretty plates. I wish it didn't bother me to drink coffee out of a paper cup. They humored me by using the throw-away stuff until we ran out. I decided after a couple of weeks to test the four-dish theory. I set a drainer by the sink and informed them that IF they used a real dish, it must be promptly washed and place in the drainer to dry. It worked for a day. Or two. Now, weeks later, we're back to our slovenly ways. As I stand at my sink, I feel like a failure. It's the loneliest gig in town. I've decided, with clenched jaw, to be strong until they leave for homes of their own. What goes around, comes around... someday, as they stand at a sink up to their elbows in suds, they may have their own moment of clarity. A friend of mine mentioned that she is currently in the process of moving from her large four-bedroom house into a small two bedroom condo with her husband. The two adult boys living at home will have to find other accommodations very soon.